I love whittling and spoon carving but gripping the tool for long periods causes me to get a kind of pins-and-needles, hot/cold, numb feeling in my hands and fingers. This is probably exacerbated by some bad accidents I had when I was an arborist so I have to accept that and try to work out what I can do to alleviate it. When we look at edge tools we’re very often preoccupied with the quality of the steel and it’s edge-holding capabilities but the handle which forms our interface with the tool is usually overlooked. Clothes and shoes come in a range of sizes so you can choose those that most nearly fit -or if you’re feeling plush you could have them handmade to fit perfectly. But all the tools, artefacts, utensils, implements and vessels - all the things we pick up with a handle - come in a choice of one-size-fits-all. 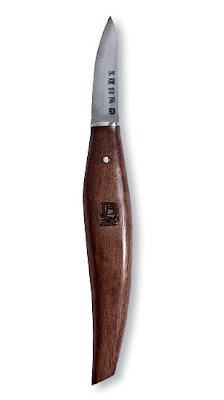 I was perusing the latest tool catalogue from Rutlands recently and in the section of seriously gorgeous Japanese tools came across some carving knives. They make the claim that “ Each blade is mounted in a solid hardwood handle that is shaped to fit perfectly in the hand.” Whose hand? A child? A giant with hands like hams? Someone suffering from arthritis? I decided to have a look in Wiki and see what I could find out about Ergonomics. This led to such things as Time & Motion Studies and probably ultimately to our dreaded Health & Safety Executive. The information is interesting if a little wordy and technical - have a look at it here. I’ve recently put handles on a couple of spoon carving knives made by Duncan Chandler alias FGYT and an old Marples adze which Jon Warricker kindly reforged into a curve and tempered for me. I tried out Duncan’s knives in the Spoon Knife Passaround early last year and one of the things which impressed me about them was the shape and size of the handles. I bought a couple of blades from him and he supplied a template of the handle shape. It’s similar to the American Flexcut knife handles. The manufacturers of these claim that “The comfortable curved ergonomic handle allows for long periods of carving without hand fatigue.” I have one and it’s OK but a bit small so I made the handles for Duncan’s blades even slightly larger than the template and they’re ideal - for me. I modelled the adze handle on a Gransfors pattern but made it fatter and again it feels perfect for my hand. I realise that other people will have to use them, and the knives, but hopefully I have enough different shapes and sizes for them to find one that feels right in their hand. 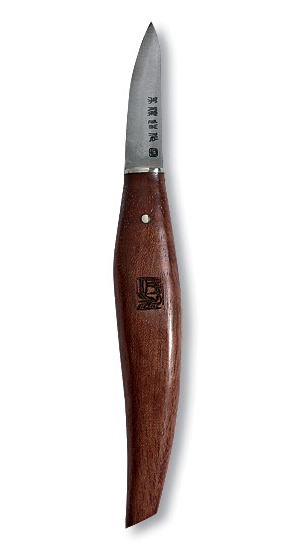 As an aside, whilst perusing the Japanese knives in the Rutlands catalogue, I came across this one which is shaped like a small Samurai sword. It even has a little picture of a Samurai on the handle! I’ve never seen them advertised before but my Dad gave me one about 5 years ago and couldn’t remember where he’d bought it. I’ve kept it mainly for trimming paper and card. The blade is made from three layers of steel, a hardened, blue paper steel core that forms the cutting edge which is flanked by a layer of softer, tougher steel on each side. I’ve never sharpened it so no doubt about it’s edge holding capabilities but the brass handle is dreadful - absolutely, totally unErgonomic! Did anyone else manage to catch Stuart King's "blink and you miss it" appearance on The Edwardian Farm the other evening? He's using a pole lathe to make some new rungs for a Devon style cherry picking ladder. See it on BBC iPlayer here. Stuart's bit lasts from 9.18-11.08 - I bet he spent all day filming for that little part! One thing I noticed is how the cord rubs across the edge of the bed. It wouldn't have lasted long if he had been making ladder rungs all day. After the Christmas decorations and lights are taken down it always seems a bit glum and gloomy and today it hardly got light and the rain has been lagging down nearly all day. I was originally inspired by the guitar that George Harrison played on "I Am The Walrus" in The Magical Mystery tour but it's ended up looking nothing like that! I feel we need to inject more colour into life. Take a look at men's clothes they're predominantly black, grey, neutral and sludge - why? I've bought some bright felt pens and I'm going to add some bands of colour to my turnings. As you can tell there isn't much bodging going on at the moment but when I do some I'll post pictures. And one that is unfortunately on the point of dying out - I think we are possibly the last people in our street to have our milk delivered by the Milkman to our doorstep early in the morning. Organic full cream, semi-skimmed and orange juice. 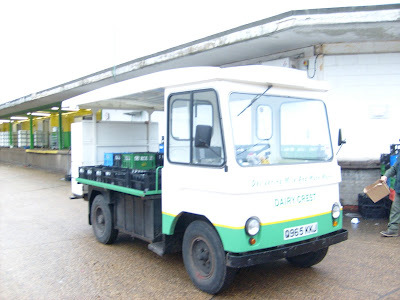 ...a non polluting, electric powered milk 'float' by Fred the friendly, whistling neighbourhood milkman. Unfortunately he retired and it now comes on a Transit. Any other blog readers still have their milk delivered?? Remember - Use it or loose it. It's a bit like the traditional crafts or buying wine that has a real cork in it (although that's getting harder and harder). Apropos of this I was once told a lovely story by Trevor Austen the Kentish Rakemaker who sadly passed away on Christmas Day after 5-6 years suffering from motor neurone disease. In the 1960's he found he couldn't really earn enough money from making wooden rakes to support him and his family so he took on a milk round in the morning and made rakes in the afternoon. His round took in Chilham Castle in Kent and one day in the 80's he turned up there to deliver the milk to find that they were filming Rod Hull's Christmas Special. The director spotted him and thought it would be a great idea to have Rod and Emu arriving at the castle in Trevor's milk float. He got permission from his boss and went back later in the day to film it. Well, Rod and Emu jump off the milk float, say goodbye and thanks to Trevor and Rod grabs a pint off the back. Trevor said quite indignantly "They never paid me for that pint either!" See Stuart King's film of Trevor making a rake here. And on the Museum of English Rural Life website his brother, David, demonstrating on Trevor's behalf - note the milkman's overall which they always used to wear in the workshop.